This pattern is available from shadowdancer.typepad.com for $4.00. 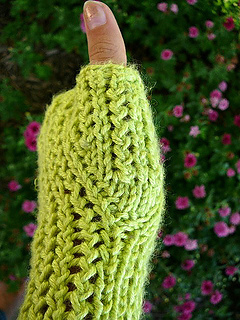 I designed these lacy fingerless gloves for my daughter. They have a touch of ribbing at the wrist to improve the fit. The simple lace pattern extends into the thumb, but disappears for the palm so that it won’t catch on little things when you pick them up. 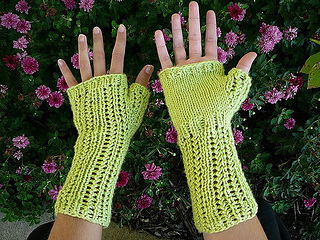 I disovered, to my glee, that because of the stretchy nature of the lace pattern, they fit a wide range of hands. This means that they’re great for ‘tweens! BUT.. they’re great for adults too! They use a single skein of DK weight yarn. 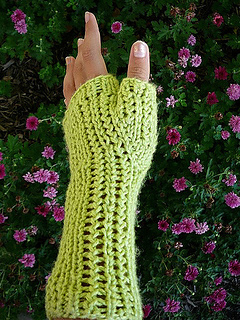 The pattern includes a chart for the lace pattern, as well as written directions. It also has step by step directions for each mitt (instead of simply saying “reverse shaping for other mitt”). Many thanks to my wonderful test knitters septembersocks and. I couldn’t have gotten it out her without them!